Sure the UFC heavyweight title is on the line at UFC 116 on Saturday night, but the stakes have been raised even higher for the hotly anticipated Las Vegas showdown between Brock Lesnar and Shane Carwin. All of a sudden, Lesnar and Carwin find themselves in the position where the winner could – and should – become the planet’s top 265-pounder. 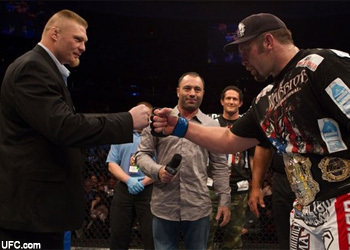 Fans may have missed an opportunity to see Carwin and Lesnar go at it almost 8 months ago at UFC 106, but the timing of Saturday’s showdown couldn’t be more perfect. With Emelianenko’s shocking submission loss, a massive void needs to be filled atop MMA’s heavyweight class and it’s safe to assume the victor inside the MGM Grand Garden Arena would fill the spot very nicely. After years of dealing with Fedor’s management (M-1 Global) and posturing with the MMA community about how the best heavyweights compete inside an Octagon, UFC president Dana White will finally have something to smile about come Saturday night – : D.